The University of Rhode Island Rams Women’s Soccer Elite ID Camp will fall on July 13 and July 14. This soccer identification camp is for both field players and goalkeepers. This event is open to all high school female soccer players in the graduating classes of 2019, 2020, 2021, 2022, and 2023. The program is going to take place at the beautiful University of Rhode Island campus. In addition, this soccer camp includes field sessions, classroom sessions, strength and conditioning sessions, and games. It is set to start at 11:00 AM on Day 1 and end at 4:30 PM on Day 2. Registration fee is $300 per player. Division I. Their nickname is the Rams and their identity colors are blue and metallic gold. 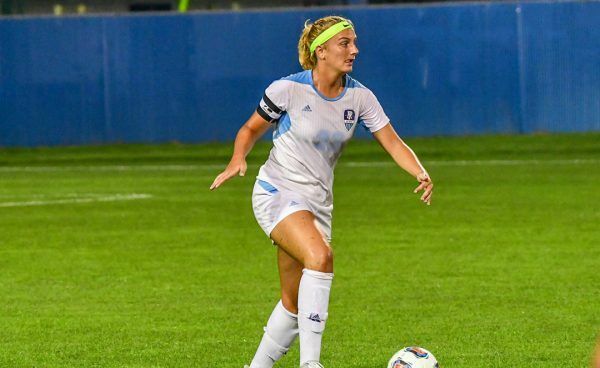 The head coach of the University of Rhode Island Rams women’s soccer team is Megan Jessee. She is in her first season at the helm of the Rams women’s soccer program. Coach Megan Jessee is a bachelor’s degree graduate from the University of Connecticut. She is the former Wake Forest University assistant coach and was part of the Demon Deacons’ 2010 Atlantic Coast Conference championship team. Additionally, Coach Megan Jessee also had a coaching stint at Slippery Rock University, Connecticut Olympic Development Program, and the FSA Soccer Plus Football Club, Soccer Plus Camps. Then, the University of Rhode Island Rams women’s soccer associate head coach is George Kostelis, a native of West Hartford, Connecticut. Coach George Kostelis is now entering his second season with the coaching staff. He is a bachelor’s degree in Human Services from the University of Hartford. Ultimately, Coach Kostelis is an inductee into the 2007 Hawk’s Alumni Hall of Fame. The Rhode Island Rams women’s soccer assistant coach is Jenna Kalwa. Coach Jenna Kalwa who hails from Pennington, New Jersey is also entering her second season with the coaching staff. She is a bachelor’s degree in social work graduate from North Carolina State University. Finally, the team’s volunteer assistant coach is Davis Fox. The University of Rhode Island Rams Women's Soccer Elite ID Camp is designed to players an extensive exposure to a college-level training and playing environment. It is also set to improve the player's technical and tactical abilities. This program will take place at the scenic University of Rhode Island campus in Kingston, Rhode Island.